UPDATE May 2 2014: FDA today announced its intent to effectively ban the sale of laser pointers and handhelds over 5 milliwatts. To do this, they are expanding the existing definition of “surveying, leveling and alignment” lasers to also include any laser that is compact, battery powered, and can be held in the hand. The discussion below was written by LaserPointerSafety.com well before the FDA action. It first objectively describes FDA’s authority, then gives analysis and opinion stating that FDA is wrong in its arbitrary re-definition of SLA lasers. UPDATE October 25 2016: FDA wants to designate all laser pointers that are not red as “defective.” This designation would prohibit U.S. sales of green, blue and other non-red pointers and would make it easier for FDA to control and seize imports of such lasers. In addition, the agency proposed a new definition of “laser pointer.” For a detailed description of the proposal, and FDA’s rationale behind this move, see our October 26 2016 news story. If this proposal is enacted, some of the information below would change. The diagram shows which laser wavelengths (colors) FDA wants to prohibit. The U.S. Food and Drug Administration regulates laser products under 21 CFR 1040.10 and 1040.11. These regulations cover laser products in general, as well as three specific uses: medical, demonstration, and “surveying, leveling or alignment” (SLA). Demonstration and SLA products must be Class IIIa (also called 3R) or lower. This means that their output power must be below 5 milliwatts. Note that laser pointers and handheld lasers are never mentioned in the regulations. When the regulations were developed, between 1968 and 1976, no average person used a laser as a pointer. This is because even low-powered lasers were bulky, AC-powered, and expensive. Certainly the regulations’ authors never envisioned today’s small and powerful portable lasers being sold inexpensively to consumers. If a handheld laser is promoted for pointing out objects or locations, then FDA says it can be regulated either as a demonstration or as a SLA laser product. If a handheld laser is promoted for entertainment or amusement purposes, then FDA says it can be regulated as a demonstration laser product. No matter which category (demonstration or SLA) is applied, the result is to restrict the laser’s power to less than 5 milliwatts of visible light. This document lists FDA’s justification for regulating laser pointers and handheld lasers. It specifically states that high-powered (>5 mW) handheld lasers can be sold if they are not promoted for “pointing or amusement” purposes. UPDATE SEPTEMBER 2014: On July 5 2014, FDA published a webpage stating that handheld, battery-powered lasers must be limited to 5 milliwatts. The webpage refers to pointers only once, in the title and in quotes. This indicates that to FDA, higher powered handhelds (above 5 mW) are not pointers. The entire document is interesting for its careful wording discussing FDA regulatory authority. When did pointers first become regulated as demonstration and/or SLA lasers? LaserPointerSafety.com has been told that the determination was made when under-$100 diode pointers first appeared in the late 1980s. CDRH staff felt these were for determining the position of a point (e.g., a point of interest to the lecturer) and that they defined a straight line. Thus, lasers used for pointing were regulated as SLA lasers, which limit the output to less than 5 mW. Manufacturers were notified individually at first. Word spread and no one objected. CDRH did not believe it was imposing any new restrictions, so that a new regulation was not needed. A query to the FDA provided additional information. They noted that the pointers-as-SLA decision was not announced in the Federal Register, nor in FDA Laser Notices. The FDA noted that “because of the way the regulations are stated, the FDA determined that a guidance document was not needed when making this determination.” We have made available the query and the FDA’s detailed reply about laser pointer jurisdiction and regulatory history. There is an obvious loophole here -- if a handheld seller does not call a laser a “pointer” and does not promote it for pointing, entertainment or amusement, they can legally sell whatever power they want. This is why so many lasers are sold for burning purposes, or for popping balloons. These do not seem to fall under either the demonstration or SLA usage categories. A note from the website’s author: The material below represents my personal thoughts, like an editorial. It differs from most of the information at LaserPointerSafety.com which is fact-based and strives to have no particular point of view. The following gives my analysis and opinion. On May 5 2014, FDA proposed expanding its interpretation of “surveying, leveling or alignment” so that all handheld lasers -- not just pointers -- would be in this “SLA” classification. FDA’s intent is to classify any compact, battery-powered, portable, handheld laser emitting a straight beam into open space as an SLA laser. FDA has no special authority over “handheld” lasers. They cannot regulate based on the size or configuration of a laser. FDA is completely wrong to classify pointers as “surveying, leveling or alignment” lasers. There is no way that simply pointing at something -- without trying to measure, survey, level or align it -- falls under any aspect of the SLA definition. FDA has no authority over lasers used for “amusement”. FDA does have authority over lasers used for “entertainment” but this is a concept which is more specific than the nebulous “amusement”. Details about these objections are listed below. In addition, the official comment submission by the website’s author, to the FDA, regarding their May 5 2014 Draft Guidance can be downloaded here. Note that the version you download may not necessarily be the final version submitted to FDA by the August 3 2014 deadline. What authority should FDA have? Our view does not mean that we believe laser pointers should be unregulated. Although we believe FDA’s asserted authority over handhelds and SLA pointers is incorrect, we are willing to accept their view on pointers < 5 mW for pragmatic reasons. This view has been entrenched for so many years that it is reasonable to accept FDA’s de facto regulation of visible lasers less than 5 mW. We also share and understand concerns of those at FDA and elsewhere who want reasonable restrictions on consumer access to handheld lasers above 5 milliwatts. Depending on a person’s view of the dangers of laser misuse, such restrictions may be justified. However, it is vital that any restrictions be legitimate. If Congress wants to pass a law to regulate handhelds, that is the correct and legal way to give FDA increased authority. Also, if FDA is able to find regulatory authority in some other way, such as a valid new interpretation, that is fine as well. But FDA cannot go about redefining the English language so that lasers outputting a straight beam are somehow “surveying, leveling or aligning.” That is simply incorrect. Further, to say that this definition only applies when a laser is handheld is ludicrous. 21 CFR 1040.10 makes no mention of size as a criteria for classifying lasers. Furthermore, there is no reasonable interpretation of demonstration or SLA laser products where size would somehow qualify a laser as falling in these categories. Finally, FDA has not defined “handheld” in any formal way. For this reason, the remainder of this discussion concentrates on handheld lasers used to point; e.g., “laser pointers”. As noted above, there were no laser pointers in 1976, when 21 CFR 1040.10 and 1040.11 were first issued. That is why the word “pointer” is not in the regulations. While the word “point” does appear, it is used as a noun (“…emission duration at a particular point…”). Thus, FDA has no explicit authority over lasers used for pointing. At described above, in the late 1980s, FDA determined that pointers were demonstration or SLA lasers. But this was slipped in -- there was no Federal Register or FDA Laser Notice made to the public. 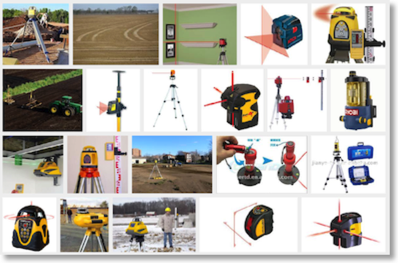 Simply considering plain English language, it does not seem as if a laser being aimed at a PowerPoint slide is in any way being used for surveying, leveling, or alignment. 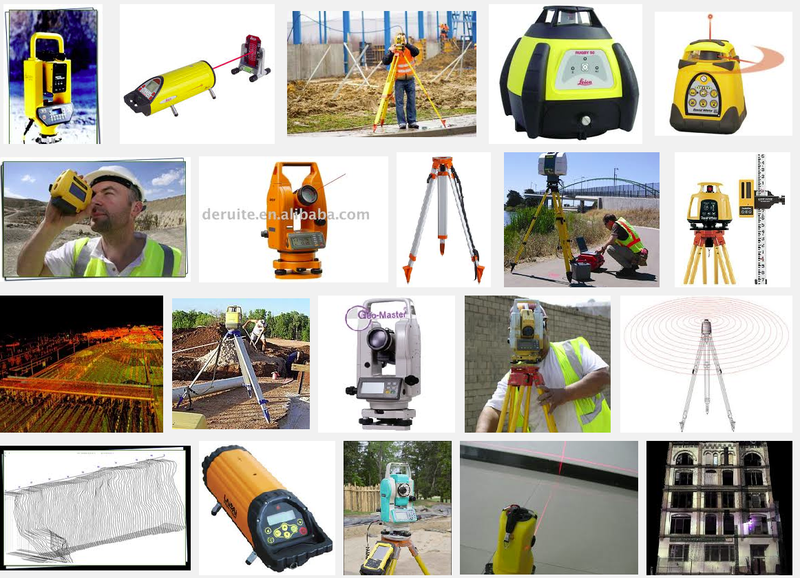 For example, take a look at these lasers found using a Google Image search for “surveying laser”. They are very specialized; none look like a laser pointer or handheld laser. 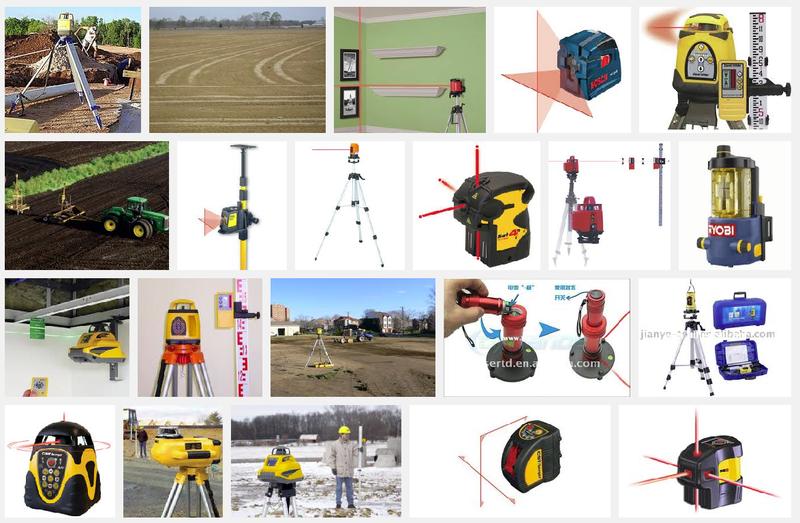 Below are results from a Google Image search for “leveling laser”. Again, none look like a laser pointer. 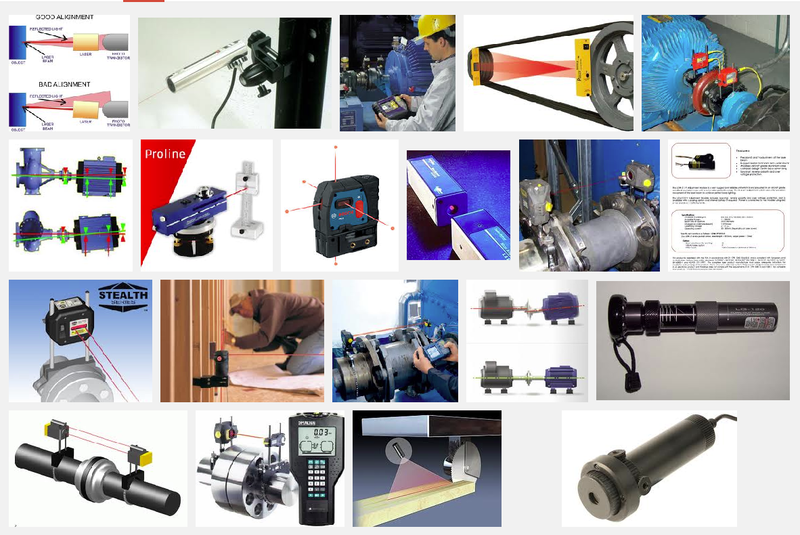 And finally, here are results from a Google Image search for “alignment laser.” A few of these look like a laser pointer, or may even use a laser pointer in a special holder in order that it can be aligned with some other object such as a telescope. But keep in mind that a laser pointer or handheld alone cannot function as an “alignment” laser. At at the very least a laser needs to be in a special holder to keep it in alignment with something. 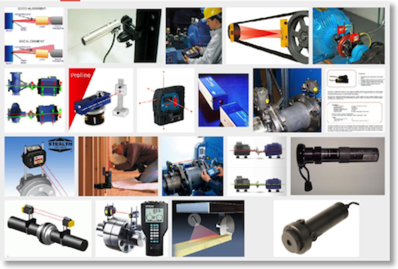 Simply handholding a laser to point at a PowerPoint slide or an object does not mean a person is doing alignment (synonyms: “adjustment, arrangement, calibration, order, positioning, sequence, sighting”). (iii) Defining a plane, level, elevation, or straight line. (i) A laser used for pointing is not measuring anything. It also is not determining or delineating the form, extent or position of a point, body, or area. (ii) A laser used for pointing is not positioning or adjusting anything. (iii) A laser used for pointing is not defining a plane, level or elevation. It also is not defining a straight line. We have been told that when CDRH first went to regulate pointers, they concluded that pointers were “determining … the position of a point” that was of interest to the lecturer and audience. We disagree. The lecturer and audience are not trying to determine where the point is, in the sense of measuring, surveying, leveling or aligning. They certainly are not “taking angular measurement”. They simply are using the laser’s dot to call attention to a location. Often a pointer’s beam is so weak that it cannot be seen in mid-air. Only the dot at the end of the beam is visible when it is on a surface. In such a case, there is no beam and thus no straight line at all. Even if the laser’s beam can be seen, it is not being used to “define” a line. The presenter and the audience are not interested in the line per se. They are interested in what the line is pointing at. A final, fatal blow to the “straight line” interpretation is the fact that almost all lasers create straight lines. This does not mean FDA can regulate selected or all laser uses based on this fact. If so, Congress would simply have given FDA authority over any laser that could create a straight line. But 21 CFR 1040.10(b)(39)(iii) is part of a limited grant of authority, first over “surveying, leveling or alignment” uses and second only over applications where the laser product DEFINES a straight line – not IS a straight line. 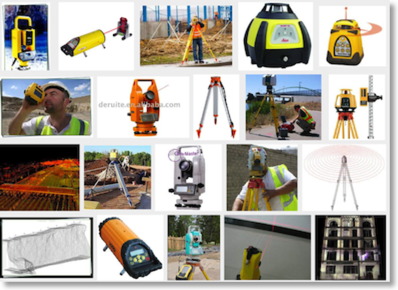 In summary, even a cursory reading of the uses being defined – “surveying, leveling or alignment” – cannot support the argument that pointing at an object is surveying, is leveling or is alignment. If this was correct, then a person thrusting their outstretched arm at an object and saying “look over there” would somehow be involved in surveying, leveling, alignment, angular measurement, positioning parts or defining a straight line. But this is simply not true. Demonstration laser product means any laser product manufactured, designed, intended, or promoted for purposes of demonstration, entertainment, advertising display, or artistic composition. Pointing does not fall into the “demonstration” category. A person aiming a laser at a PowerPoint slide is not demonstrating how the laser works. They are not demonstrating the beam (often the beam is so weak it cannot even be seen). They certainly are not demonstrating the slide. Instead, they are highlighting or calling attention to the location of an item of interest. The term "demonstration laser product" does not apply to laser products which are not manufactured, designed, intended, or promoted for such purposes, even though they may be used for those purposes or are intended to demonstrate other applications. We do find some merit in the FDA’s April 2013 statement that pointers sold with caps using diffraction gratings to make patterns or shapes, could be considered “artistic displays” or “laser light show projectors” and thus could be regulated as demonstration lasers. As noted above, we are willing to accept FDA’s authority over laser pointers less than 5 mW, because this is such a long-standing and entrenched interpretation. While we believe the FDA is incorrect, it is pragmatic just to leave this as is. 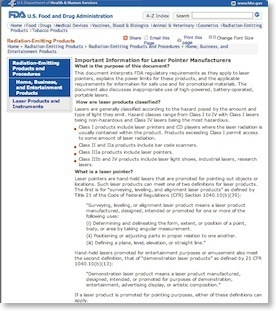 The FDA document “important Information for Laser Manufacturers” incorrectly states that the agency can regulate lasers sold for “amusement” purposes. This is not true; the word “amusement” does not appear in 21 CFR 1040.10. FDA should instead use “entertainment”, which is the closest accurate term that does appear in 21 CFR 1040.10(b)(13). The distinction is important. “Entertainment” implies an active party -- an entertainer -- and a passive party -- an audience. The concept of having a viewer or audience is embodied in all categories defined as “demonstration laser products”: demonstration, entertainment, advertising display, or artistic composition. We agree with FDA that they have the authority to regulate laser products used in a demonstration (showing other persons how lasers work), or for entertainment (where there is at least one audience member viewing a show) or for advertising displays (where consumers see the ads), or where someone has created a composition designed to be appreciated as art. But FDA does not have the authority to regulate a laser based on its use being “amusing”. The word does not appear in the regulations. And even if it did, “amusement” is a nebulous concept. One person’s “amusement” at popping balloons could be another person’s learning experience. For example, the balloon color and thickness, the ambient temperature, the laser’s power and irradiance, and many other factors determine whether a balloon will pop with a given laser.